Home of original fine jewelry created from unique glass beads from Africa and around the World. Here at ABeadC Designs Wanda Haber-Kucharsky creates fine jewelry with Powder-glass beads and various metals that are hand-made by village artisans from Ghana using a centuries old method. Each bead and ornament is unique. She can also create customized jewelry for your outfits or redesign old beads for a new look. Designer and Owner, Wanda Haber-Kucharsky has thousands of ideas just waiting to be created! Order now and discover the beauty of the jewelry at ABeadC Designs! We have a catalogue that represents some of her ready made items. Take a look and see the wonder and beauty of this jewelry. 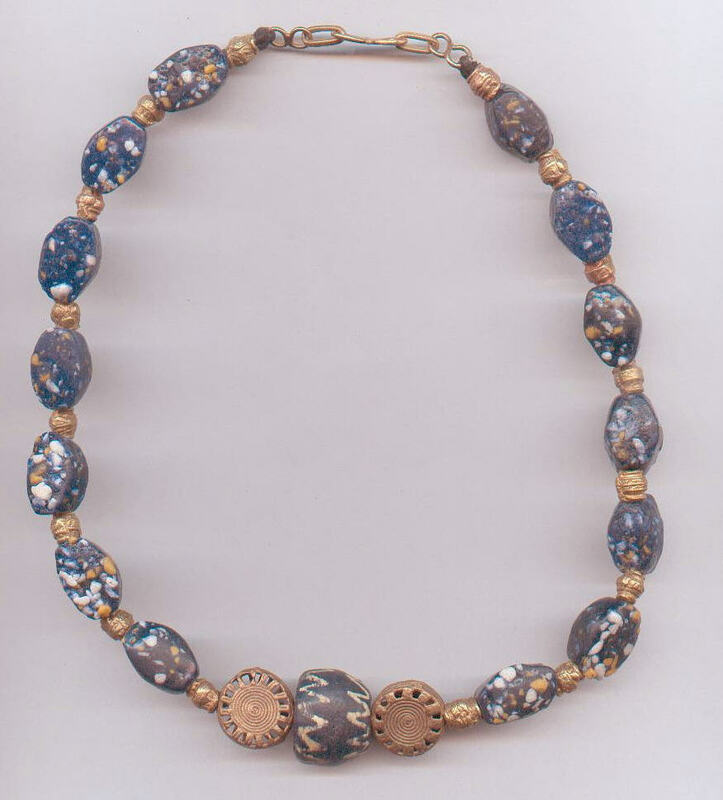 This one-of-a-kind choker features Denim speckled Powder- glass beads, unique brass spheres and is finished with a brass clasp, all of which are from Ghana. Click on the links above to view our collection of jewelry available for purchase. If you don't see something that you like Wanda will custom design jewelry for you. Please contact Wanda by telephone or email her. Please check back often to see new designs and creations by Wanda.